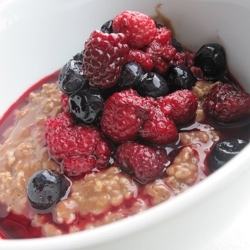 Here’s a deliciously decadent twist on your standard bowl of oatmeal: Stir in antioxidant-rich cocoa powder for rich, chocolate flavor and top off the creamy whole grain oats with sweet berries. You’ll feel like you’re eating dessert for breakfast! Prepare the oats with water or skim milk according to package directions. Stir the cocoa powder, sugar, and vanilla extract into the prepared oatmeal. Top with berries (or sliced banana).